The redesigned 2016 Camaro launches in the fourth quarter. DETROIT -- Chevy is giving the sixth-generation Camaro a leaner design and a broader engine lineup as it tries to fend off the revitalized Ford Mustang for pony car supremacy. The 2016 Camaro coupe retains the overall shape of the late 1960s-era cars, but loses some of the hard edges of today's model. Its slightly reduced size and broader use of aluminum make it more than 200 pounds lighter than the current car, which GM vows will result in more nimble, responsive handling. "For Camaro enthusiasts, it retains iconic design cues and offers even more performance," GM product chief Mark Reuss said in a statement. "For a new generation of buyers, the 2016 Camaro incorporates our most innovative engineering ideas." With the resdesign launching in the fourth quarter, Chevy is looking to build on the unlikely success of the current car, which GM insiders have said almost never came to be. Chevy brought the nameplate back in 2009 to the delight of Camaro diehards after a hiatus of more than six years. But the program had been in jeopardy in the two years leading up to the spring 2009 launch as GM bled cash, insiders have said. It also was launched into the nadir of the Great Recession and against competition from a revived Dodge Challenger and refreshed Mustang. Yet the Camaro went on to steal the U.S. sales crown that the Mustang had held since 1985, and outsold the Mustang for six straight years through 2014, hitting a high of 88,249 U.S. sales in 2011. Ford came back swinging in late 2014 with its first Mustang redesign in a decade, and Mustang sales of 42,955 through April of this year breezed past the aging Camaro's 24,229. That sales race should tighten in coming years now that their product cycles are on roughly the same cadence, says IHS analyst Peter Nagle. 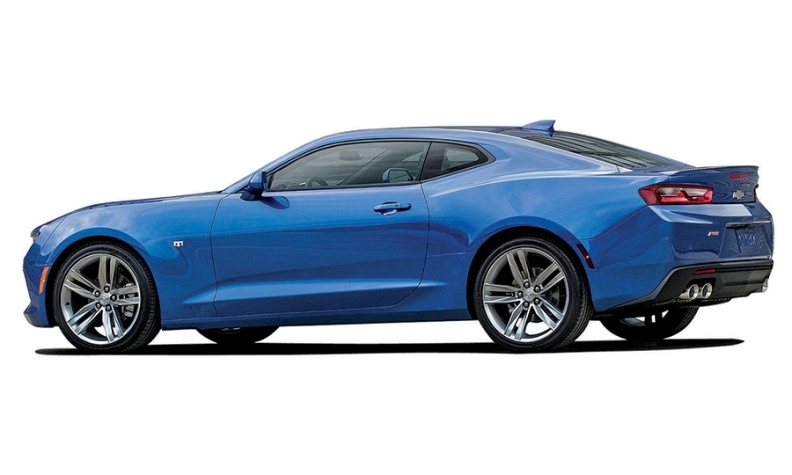 The Camaro is built on the same platform that underpins the Cadillac ATS and CTS sedans. The Camaro's wheelbase shrinks by 1.6 inches vs. the current car. Overall length is 2.3 inches shorter. GM says the 2.0-liter turbo will return 275 hp and go from 0 to 60 mph in less than 6 seconds. It will also be the most fuel-efficient Camaro ever, with an EPA rating of 30 mpg on the highway. The new 3.6-liter will produce an estimated 335 hp and 284 pounds-feet of torque. Both the 2.0-liter and 3.6-liter will come hooked to a six-speed manual transmission or a new paddle-shift eight-speed automatic.